Is it Safe to Use Essential Oils With Dogs? We get asked almost daily in our safety group about using essential oils with pets (usually dogs and cats). Because the usage information for dogs and cats is not the same, I have split the information in two posts: this one for dogs, and one for cats. dogs are more sensitive to essential oils than humans are. Essential oils should always be used diluted, even when just inhaling. This is important to remember, as we humans don't dilute when inhaling. 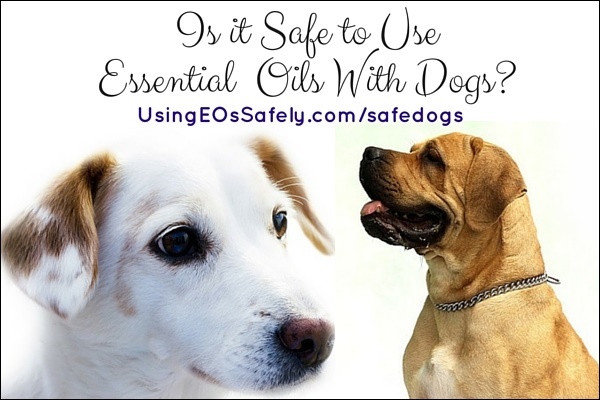 most issues that dogs have can be addressed with the inhalation of diluted essential oils. There are a few issues which can be addressed with topical use, and they will be addressed below. only use essential oils with your dogs when needed to address a concern – not to “prevent” a health issue. An example is to have them inhale a digestive essential oil after they eat, when they don't have any digestive issues. This is not recommended. 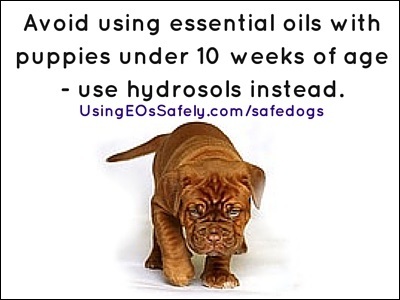 avoid using essential oils with puppies under 10 weeks of age – use hydrosols instead. Caroline Ingraham is recognized as the go-to expert when it comes to using essential oils with animals. She founded the approach, referred to as applied zoopharmacognosy, which allows animals to self-select the essential oils which will benefit them the most. 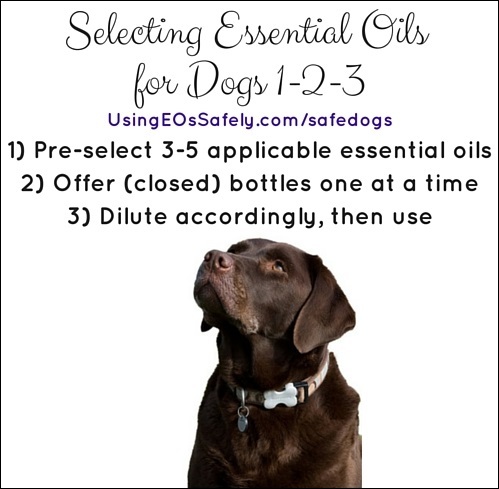 When offering essential oils to your dog, you want to first pre-select 3-5 essential oils from the safe list which you believe to be the most effective for the issue that needs addressing. There are often several essential oils which can be beneficial, and allowing your dog to choose which one specifically will ensure you do not go wrong. As explained in this free essential oil course, the essential oils are offered as closed bottles, one at a time. Allow your dog to sniff the closed bottle (remember, dogs have an incredible sense of smell and even when the bottle is closed, this is enough for them) and once you know which one(s) your dog prefers, you can then dilute accordingly. Nayana Morag shows in her video course offering her hand to her dog, with the diluted mixture on her hand. The dog can then inhale or lick. How often to offer essential oils to your dog depends on the situation, and is beyond the scope of this post. Please check out the Resources listed at the bottom of this post for more information. 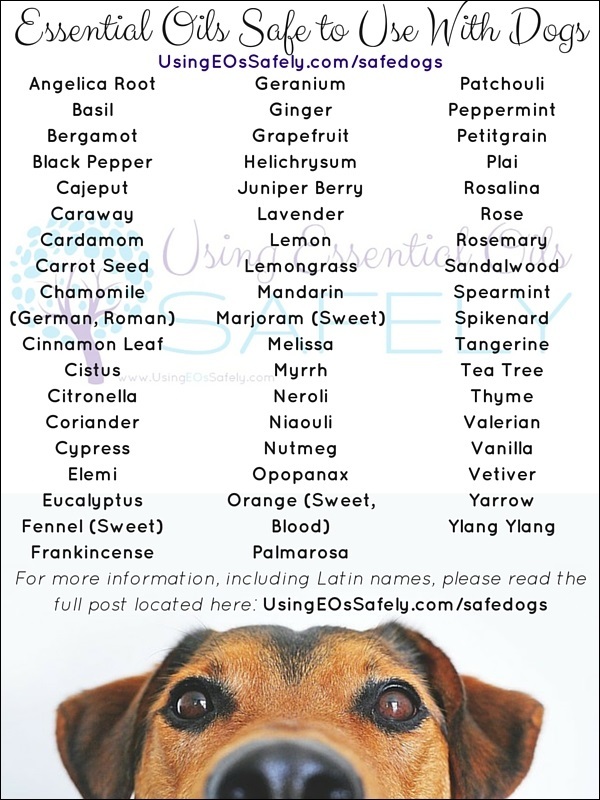 Here is a list of essential oils that are known to be safe for use around dogs according to the essential oil animal experts (listed in resources below). You can find uses and actions of the essential oils in the book The Aromatic Dog. 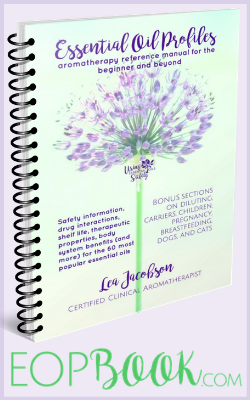 The book also contains information on hydrosols, carrier oils, the zoopharmacognosy method, relieving specific problems, first aid suggestions, how to make lotions, and more. Tea Tree Melaleuca alternifolia For more info on tea tree please see below….. Essential oils must always be diluted before using topically or offering them to your dog to inhale when using as a remedy. 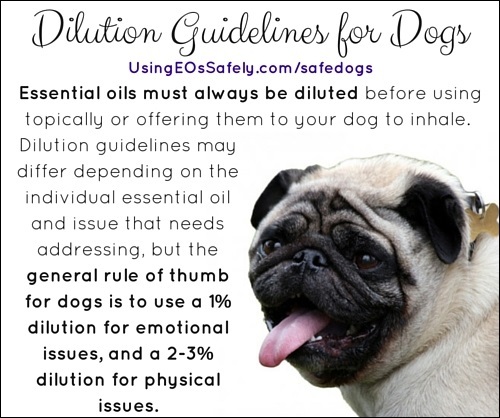 Although dilution guidelines may differ depending on the individual essential oil and issue that needs addressing, the general rule of thumb for dogs is to use a 1% dilution for emotional issues, and a 2-3% dilution for physical issues. Please note that physical issues don't always require topical application. Nayana shows in her EOs for dogs course that inhalation can be effective for pain control and wound healing. For information on calculating dilutions, visit this post: Diluting Essential Oils Safely. There are many carrier options available, and none are known to be unsafe for dogs. You can read my post Choosing Carriers for Essential Oils for some ideas, which include oils, as well as lotion and aloe vera. You can allow your dog to select the carrier oil the same way you offer them essential oils. You can make your own gel base by whisking together 1 teaspoon of xantham gum and 1/2 cup hydrosol for topical application. Hydrosols can be used safely with dogs (and puppies!). You can add them to their drinking water, when applicable. Hydrosols are gentle, yet effective. Just like when offering essential oil choices to your dog, offering choices of hydrosols is also a good idea. For emotional issues, up to 10 drops can be added to their drinking water. For acute issues, add up to 1 teaspoon to their drinking water. In some cases of shock or trauma, 1-3 drops of hydrosol can be applied directly to the tongue without dilution, as long as the dog is agreeable. Add the drops to a pipette and judge your dogs response to the pipette before applying to the tongue. Never force it. The following are highly respected references for using essential oils with animals, all of which I own (books) or completed (courses): this book, and this one, this free course, this dog- specific course, and this dog-specific book. For herbal suggestions, read An Introduction to Canine Herbalism. This question comes up often, because in my post about dogs I have Tea Tree listed as safe for use with dogs when used appropriately. This was after consulting two popular books about aromatherapy and animals, and taking a highly respected course on animal aromatherapy. I think we can all agree using that much of any essential oil is not cool! And it does state here 1-2% dilution is non-toxic. And I only recommend 0.25% topical use. Citation 4 is a link to here which discusses that it is unsafe around cats (I agree). This all said, if you disagree, and want to avoid using Tea Tree around dogs – go for it ? Want to learn more? View our website index here. Have a question or comment? Leave it below, ask in our Facebook group, or e-mail Lea. UEOS, LLC is a participant in the Amazon Services LLC Associates Program, an affiliate advertising program designed to provide a means for sites to earn advertising fees by advertising and linking to amazon.com.